Avi Ram is a 30-year old professional airbrush artist originally from Israel. Avi began drawing as a child and at 18 years old decided to teach himself how to create airbrush art. His first professional job as an airbrush artist was in Israel in an airbrush store creating art on t-shirts. He decided to combine his passion for drawing and painting and began teaching airbrush classes. He has an ability to re-create any design or art from an object or a picture and bring it to life. Avi also creates a composition in his mind and then transfers the thought by free-hand to his medium, such as a canvas, clothes or metal (cars, motorcycles, etc. ), where the natural evolution of the illustration comes together with the different elements, characters and colors. Avi start doing “body painting” in 2010, at clubs, bars , photoshoots and more. 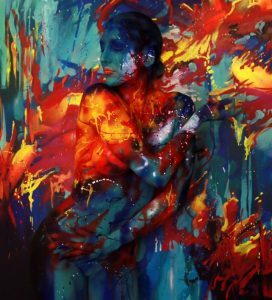 After competing in several nationwide body painting competitions, Avi Ram earned 9th place in the 2015 -“Body Fine Art”- world body painting competition in California and 1st place in the 2015- “Fabaic” – body painting competition in Florida. Avi Ram’s star started rising even more when he was featured on the reality television show “Skin Wars.” The show, an hour-long competition, seeks to find the most talented and versatile body painters in the country. Avi was a finalist runner up winner on Season 2. Getting a taste of fame, Avi went on to star in the reality show “Global Beauty Masters” where he was crowned the WINNER OF SEASON 2. Avi has recently gone on to become a mentor on the reality show “Fresh Paint” Season 1. Avi’s newest creative venture is taking his “street art” style to the fine art of bronze sculptures. 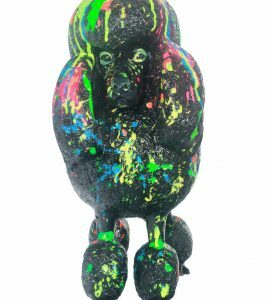 His newest collection of painted bronze poodles combines this new art movement of graffiti style art with the refinery of modern art sculpture.